One of three photos of the kayak Kelvingrove has had on its website for I’m not sure how many years. When I left Scotland in 1961 I suppose I never expected to see the kayak again. In 1982 or ’83, however, I did and in what was for me a very exciting way. Well, of course, it was a kayak not a person but a closer look and I could tell that yes I did know it. For, believe it or not, it was “my” kayak, the one made for me in Illorsuit in 1959! I still hadn’t known that it had ended up at Kelvingrove. So that was quite a day! By the way, the Hunterian has three kayaks so the one I saw in ’82/’83 may not have been exactly the same one I had seen years before. But all three of their kayaks are from West Greenland and all of them (compared to our Scottish kayaks of the 1950s) are quite narrow. In Golden’s “Kayaks of Greenland” [KoG] one is #21, one #26, and the third #28. Beam dimensions: 17 1/2 “; 17 1/4 “; 18 1/4 “. Our Scottish kayaks: 26 or 27 inches. 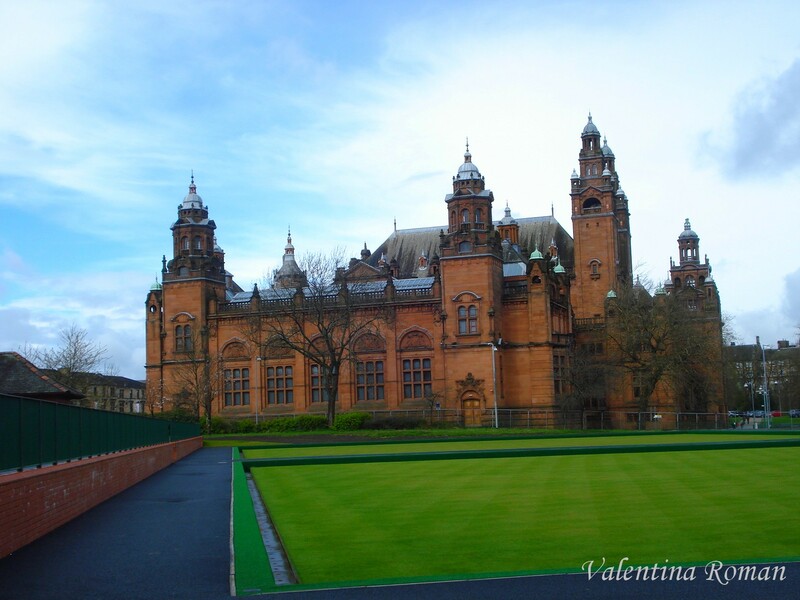 Here’s a nice photo of the Kelvingrove Art Gallery and Museum. Meantime I’d heard, years before, from someone who’d seen the kayak in storage with boxes sitting on top of it. He was concerned that it wasn’t being taken care of properly. So for many years I’d kind of given up hope for its condition. But then the news, in a post on QajaqUSA.org, that Bill Samson had seen the kayak again at the museum! It turned out that Duncan Winning, Bill Samson, and Sue Ellcome had all been there that day, in August 2012. As part of an email correspondence, Bill and Sue have both very kindly sent me copies of their many photos and their OK for me to use some of them on this website. These photos show a number of features of the kayak and its equipment in greater detail than any of mine do. And I’ve already used a few of their photos in my Chapter Seven, “The Hunting Equipment.” I’m very grateful to them both. So here it is “in all its glory,” as of August of 2012, looking to be in much better shape than I’d expected. And from what Duncan has told me, now being very carefully looked after! Its various items of equipment spread around on the tables. The appearance of the skin of the kayak, in this photo, at this date, is exactly what all the (unpainted) skin covered kayaks looked like everywhere I saw them in 1959. 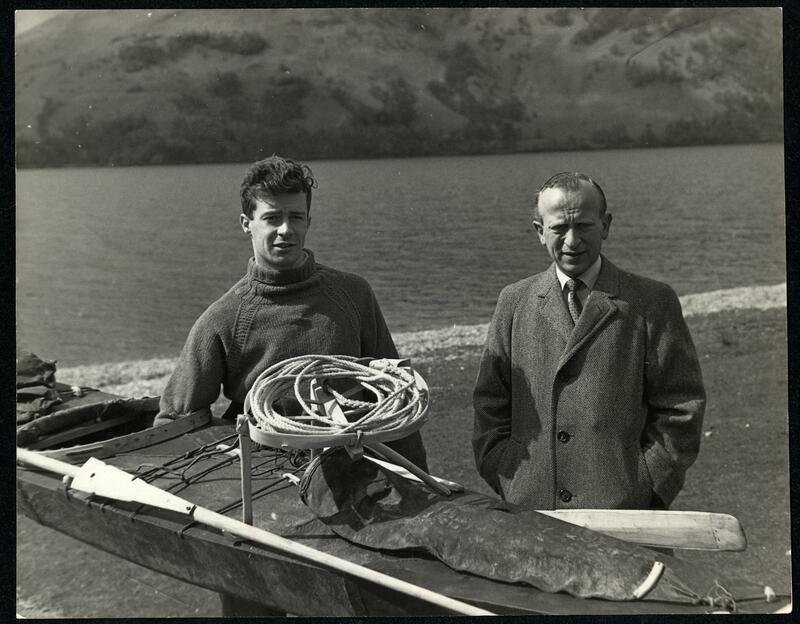 As I mentioned in the chapter on Skinning the Kayaks, the original black outer epidermis still there, for example, in the photos from Loch Lomond in 1960, had evidently quite worn off by 2012. An interior view looking towards the bow. The ribs have given way where they cross the keelson. This could be because of the weight of those boxes someone saw but it could be because of shrinkage of the skin. Golden found exactly this kind of “hull collapse” in several of the museum specimens he studied (e.g. KoG pages 159, 277, 341). You can also see the only slightly curved fore deck beams. It looks as if the beams are resting on top of the gunwales but that’s just because the upper inch or two of the gunwales is in shadow. A photo of Duncan Winning from that same day. I had left the kayak with Duncan and his close friend Joe Reid in 1961 when I moved to the States. In due course, it was Duncan’s measured drawings of the kayak that led to the creation of the Anas Acuta (see more in the chapter on Building the Kayaks). I never did get the full story from him but I believe it was Duncan who at some point arranged for the kayak to be put in the care of the Kelvingrove Museum. 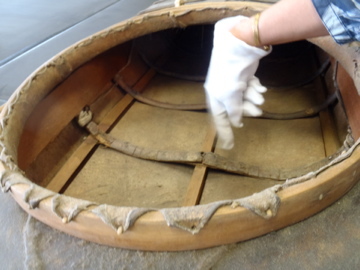 Am I imagining this or has the coaming hoop which began life as a perfectly “flat” hoop become somewhat re-shaped to fit the structure of the kayak frame (mostly to fit the rise of the masik)? 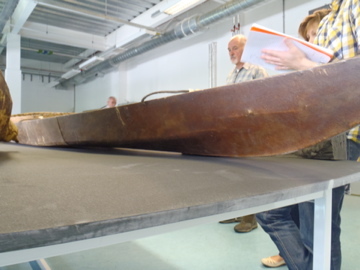 Here’s the harpoon line tray (upside down), showing what a beautiful job Johan had done. You can see the small hook at the bottom of the “pistol grip” leg which attaches to the third (asatdlerfik) fore deck thong. 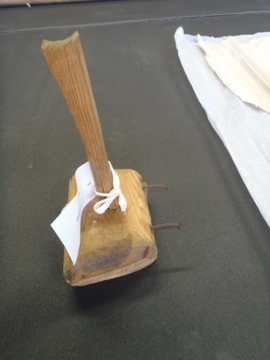 Also the vertical leg with its much larger hook which is one of the two supports for the harpoon. This photo also shows how that leg is more than 90 degrees around from the pistol grip. That’s so that the line tray can be positioned at enough of an angle for the pistol grip leg to not get in the way of the guns in the gun bag. Here I’ve zoomed in on the photo of Tobias and Enoch with their kayaks at the Karrats campsite. This let’s you see how Tobias’ line tray sits at that angle with the opening of his gun bag easily accessible. But in the 2012 photo of the line tray something is strange. The third leg is attached vertically to the ring of the tray. This is incorrect and must’ve been a “repair” done by who knows who. 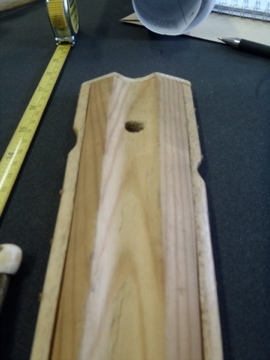 This close up of the line tray in the photo of me carrying the just completed kayak shows that this leg was originally a typical diagonal strut. A photo from Loch Lomond, in the spring of 1960, which also shows very clearly how the line tray originally had a typical diagonal as its third leg. As I’ve already mentioned, that day I had the line tray incorrectly attached to the fourth deck thong and angled too far to the right. But, because of that mistake, this photo shows all the more clearly that the third leg was indeed a diagonal. With me is Herr Madsen, at that time the Danish Consul in Glasgow. This is a photo taken that same day by Sue Ellcome, showing the line tray from the other side. You can see the dark circle on the side of the horizontal center piece of the “pistol grip” where the leg in question was originally attached. 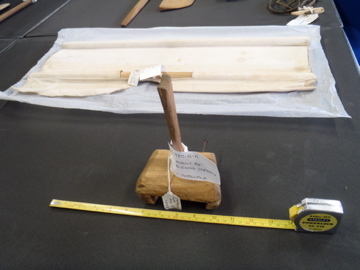 As Golden says of a harpoon line tray associated with an early kayak of the 1600s “[it] is symmetrically constructed unlike later types that have one leg protruding diagonally from the center … ” (KoG page 133). Duncan has spoken to the Museum people about this, so I’m hoping that they’ll correct it in some way. As you’ll know from almost any of my photos, during the time I was in Illorsuit the hunters never inflated the hunting float as full of air as you see it here. In a museum, on the other hand, this is probably the best way to preserve the skin it’s made of. The float is sitting on the table upside down. 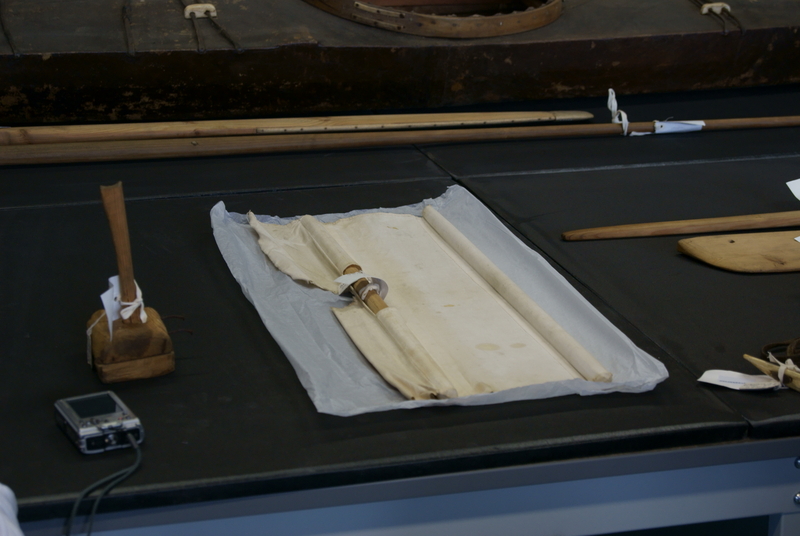 But this let’s us see the two hinged lengths of bone which are tucked under the after deck thong(s) to hold the float in place. Here they are stretched over the bulging, more than usually inflated float. A close up showing how the two bone pieces are attached, actually hinged, together. 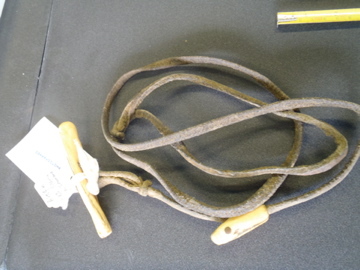 This shows the loop of thong at the back end, which provides a handle to grab the float with. 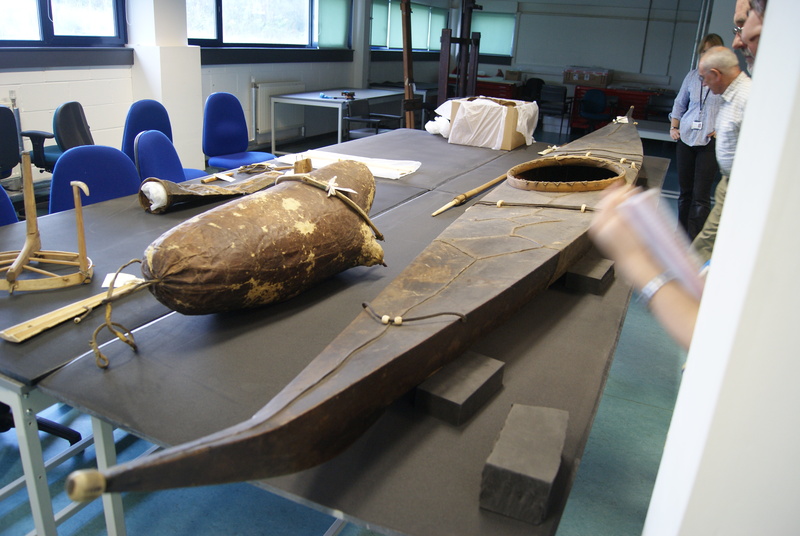 Also the length of thong coming from the forward end of the float which attaches to the harpoon line. This, of course, is way out of it’s “normal,” “correct” position. In use, it would be stretched out away from the other end of the avataq. 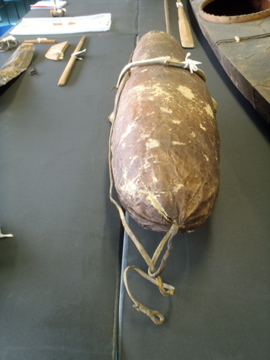 A full view of the paddle, definitely an example of that Uummannaq Bay design I speak of in the chapter on Hunting Equipment. It looks as if the blades were very slightly “feathered” to each other. But this must mean that the wood has warped a bit. When new, the paddle blades were perfectly in the same plane. 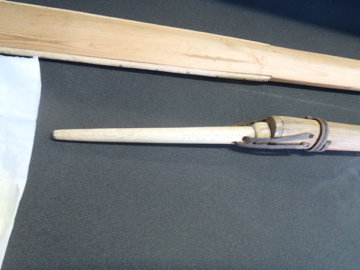 You can also see the two pegs on the harpoon shaft that the throwing stick is clipped onto. 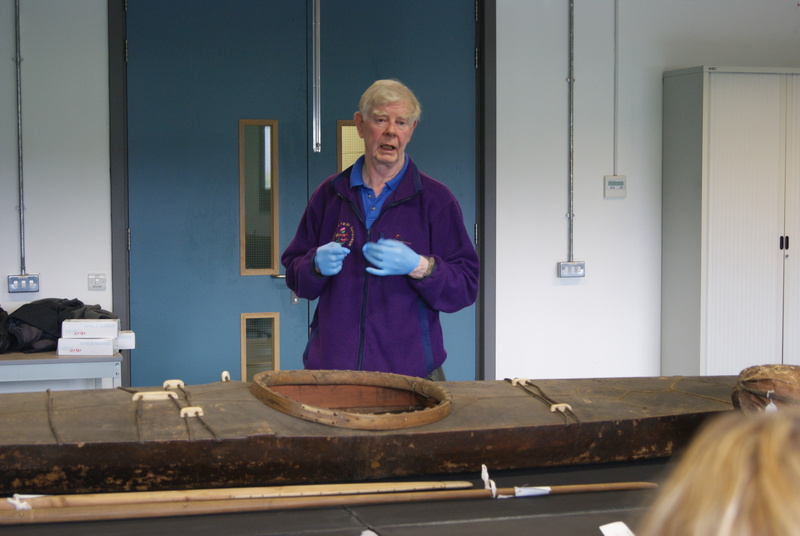 Here Duncan Winning and someone of the Museum staff are holding the throwing stick exactly where it would fit onto the pegs. 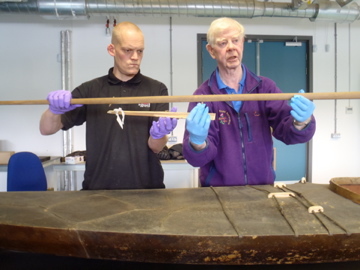 Showing how the harpoon’s foreshaft is held tightly in place and yet able to hinge over to release the harpoon head. Not so “tight” at this date but that’s because the relative warmth of the west of Scotland means that the sealskin thongs have slackened a bit. 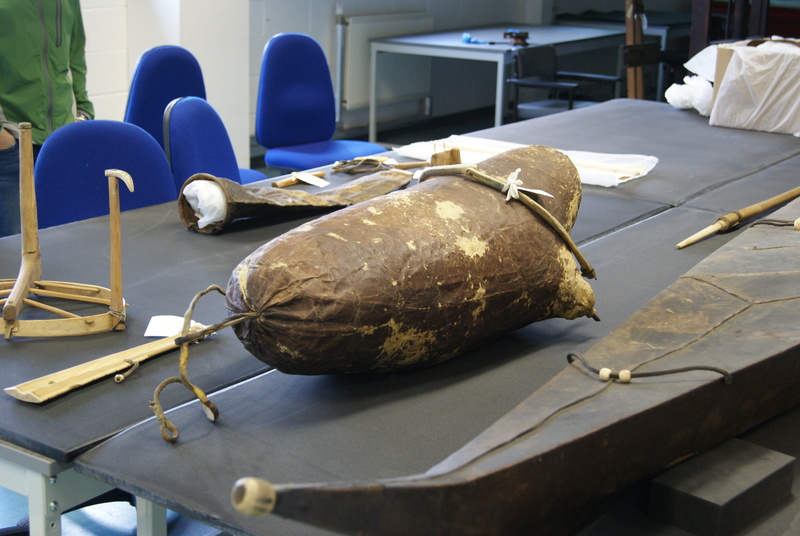 The arrangement of the thongs is almost identical to that shown by Petersen (see chapter on The Hunting Equipment). Two nice shots that show very clearly the hollow on the underside of the throwing stick which fits over the harpoon shaft. I’m pleased to see that the short thong with its ivory button is still there. 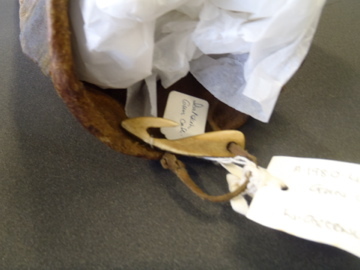 This short thong and button is missing (broken off) from the throwing sticks of both the John Heath and the Goodnow kayaks (see photos and discussion in The Hunting Equipment chapter). The shooting screen laid out flat on the table and its wooden support. The shape of its underside which allows it to clip onto the bow of your kayak. 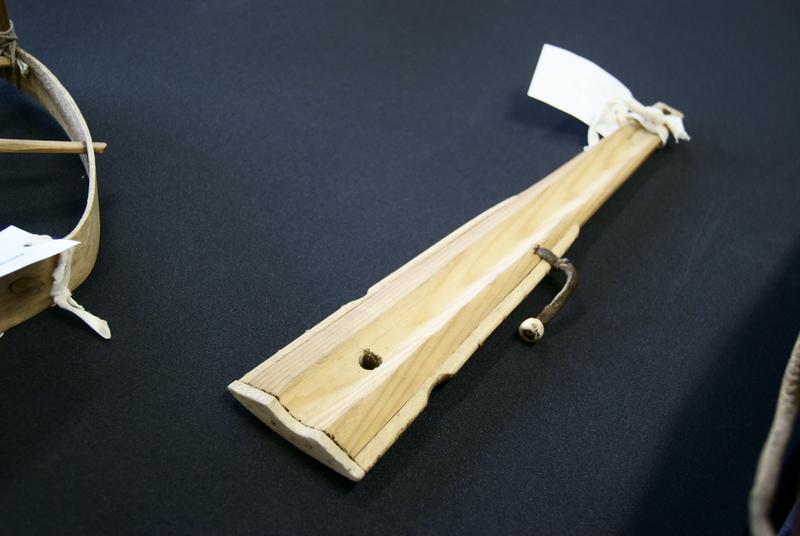 Here’s a beautifully made hook at the open (near) end of the gun bag to attach it onto the appropriate fore deck thong. 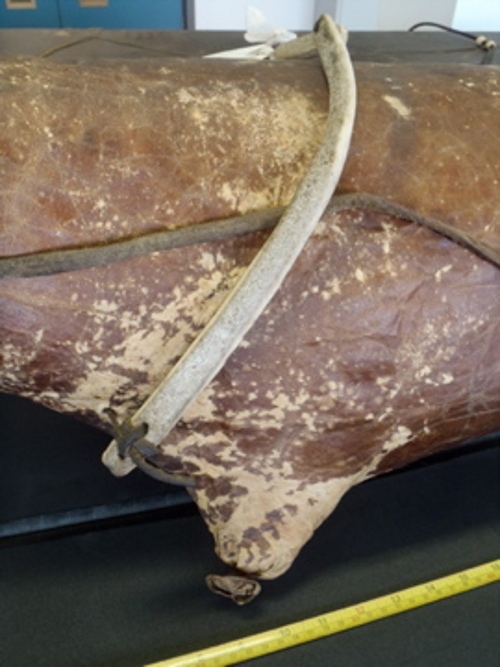 The towing strap for the head (throat) of the seal. I had no memory of this being with the kayak. Apparently there is no strap for the hindquarters of the seal, nor any sign of a flotation bladder. I describe the use and arrangement of the towing straps in detail in the chapters on The Hunting Equipment and The Hunting Trip to Umiamako. The back of the cockpit coaming where the kayak skin is pulled over and pegged onto the outside of the coaming ring. A good shot of the “slab” side of the (hard chine) kayak. 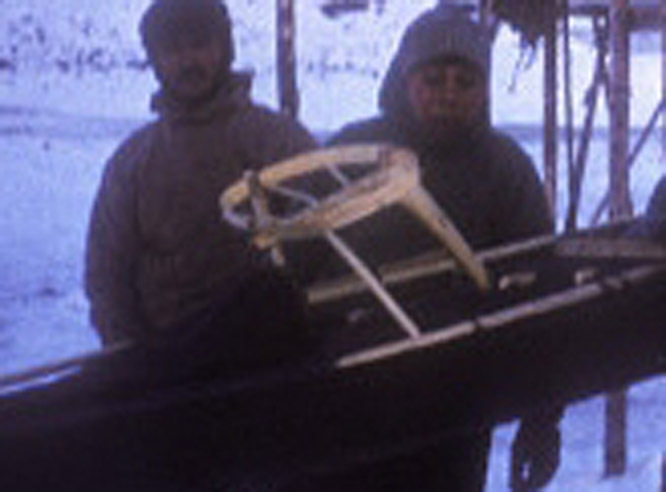 The characteristic Uummannaq Bay raked stern, with its protective knob of bone.